Buying a new Windows 8 device isn't as simple as, say, picking up a new Android tablet. The device-spanning nature of the overhauled operating system means Windows works on a vast array of hardware, from laptops to tablets to desktops to genre-straddling hybrids. Saying "I want a Windows 8 device" is just the first step of this particular purchasing journey. Our guide will clue you in to everything you need to know while you're on the hunt for a new Windows 8 device, from design differences to the little details you need to consider once you've settled on a device type. Heck, we'll even toss in a few buying recommendations--and you can find more in our chart of the best Windows 8 devices available right now. Got it? Good. Let's get educated. The first decision you have to make is easy: Do you need a desktop or a mobile device? Skip to the end if you're looking for a desktop. Settle in if you're shopping for a portable PC: Going mobile takes a bit more thought, since Windows 8 calls laptops, tablets, and hybrids home. If you're in the market for a Windows 8 notebook, PCWorld's laptop buying guide has all the info you need to make a smart decision. One Windows 8--specific thing to keep in mind: Touchscreen notebooks are nifty, but finger-friendly displays cost more and reduce battery life. If your machine's endurance is important to you, go for a standard laptop and check out PCWorld's guide to eliminating Windows 8.1's touchy modern interface. What, laptops aren't portable enough for you? A thin-and-light Windows tablet might be calling your name--if you're certain that you wouldn't prefer an Android slate or an iPad. That's a very important factor to consider before you plunk down your cash. Windows tablets, being the new kid on the block, have a few pain points. The Windows Store--which supplies the modern-style apps that power all those glittering live tiles--is still comparatively lackluster. The Nokia Lumia 2520 is the only current model that supports LTE connectivity for on-the-go usage. Windows-powered tablets are far more expensive than Android devices. And while 8-inch Windows slates from the likes of Acer, Dell, and Lenovo are starting to trickle into stores, the vast majority of Windows tablets available have 10-inch or larger displays. SkyDrive-powered syncing features make it easy to hop from PC to tablet to laptop and back again without skipping a beat. Internet Explorer 11 is a full-blown, desktop-class browser, unlike the mobile versions of Chrome and Safari. Yes, that means it works with Flash and Silverlight sites. Virtually all Windows tablet models have optional keyboard accessories. Many Windows 8 tablets ship with a free copy of Office Home & Student preinstalled. Once you've used the Snap multitasking feature, going back to one app at a time on Android or iOS just plain hurts. And of course, only Windows 8 tablets offer full access to the traditional Windows desktop and its vast horde of software--though mouse-oriented menus don't always work well on touch-focused tablets. Notice I said that Windows 8 tablets rock the desktop. You'll also find tablets running the neutered Windows RT operating system. Powered by long-lasting ARM mobile processors, they can run only modern-style apps--not desktop software. Given the still-early state of the Windows Store, it's hard to recommend a Windows RT tablet except for highly specialized use cases. Yes, the Nokia Lumia 2520 looks great and supports LTE, and yes, Microsoft's own Surface 2 is a stunning piece of hardware. For the most part, however, you should still avoid them. All other PC makers have discontinued their Windows RT tablets, though you may be able to find some at fire-sale prices. You'll want to stick to a tablet running Windows 8 proper, at least until the Windows Store matures. At the heart of virtually any Windows 8 tablet, you'll find Intel's last-gen Intel Atom Z2760 processor or one of the company's current-gen "Bay Trail" Atom processors. Both deliver all-day battery life, but Bay Trail--based tablets offer far smoother performance. You may be able to pick up an older Atom Z2760--based slate at a great price this year, but definitely try before you buy one of those. Some "tablets," such as the Acer Iconia W700 and HP Pavilion 13 x2, feature more-powerful Core i5 processors, but they're more hybrids than proper slates. More on convertibles later. While current Atom-powered Windows tablets max out at 4GB of RAM, most pack 2GB. Get as much memory as you can! Many Windows 8 tablets also have 1366-by-768-pixel screens--a resolution that looks ugly and fuzzy on a laptop but holds up well enough on an 8- to 10-inch display. Pricier slates sport sharper 1080p displays, but be warned: The higher you crank up the resolution, the smaller those already-diminutive desktop menus become. Beyond that, look for tablets that have the bells and whistles you need. For example, scope out the port selection, and find out whether a keyboard comes bundled or as an optional accessory, and whether styluses are supported. If you plan to store a lot of files or to install several desktop programs, consider buying a tablet with more storage, as 32GB won't get you far with Windows 8 installed. (Most Windows tablets offer expandable MicroSD storage capabilities, though.) And as always, try before you buy if at all possible. A wave of 8-inch Windows 8 tablets is a-coming, but we haven't had a chance to review any of them formally yet. The 10-inch Asus Transformer Book T100 stands out from the pack, and its $400 price tag includes a keyboard accessory. The Surface Pro 2 is another star performer, with a laptop-grade Core i5 processor rather than a weaker Atom chip--but we'll talk more about that intriguing beast in a bit. Keep reading to learn about the Surface Pro 2, Windows 8 hybrids, and Windows 8 desktops and all-in-ones. Now we're getting into the interesting stuff. Windows 8's unique blend of desktop and tablet interfaces has given rise to a host of hybrid devices that are sometimes laptop, sometimes slate, depending on your needs. These devices come in two primary styles: thinner, lighter "tablet-first" hybrids with slide-out keyboards, and "laptop-first" hybrids. Although a few tablet-first hybrids (such as the Sony VAIO Duo 11) were available at Windows 8's late-2012 launch, they've become increasingly rare since then. That isn't necessarily a bad thing: Small-screen, tablet-first hybrids were tinier than true laptops, sure, but they also suffered from cramped keyboards and touchpads. Bleh. The $1400 Sony VAIO Duo 13, the only notable slider-style hybrid around today, has a size and heft more in line with a laptop's, which should improve the typing, but man, that touchpad still looks small. Laptop-first hybrids are much more prevalent and generally offer a superior user experience compared with their tablet-first counterparts. These devices resemble traditional notebooks, but they sport screens that flip, fold, or rotate to transform the unit into a tablet--albeit one that's far bulkier. You should shop for a Windows 8 hybrid the same way you would for any other laptop, though you'll want to keep a few things in mind. Convertibles carry a price premium over dedicated laptops and tablets, and their inclusion of touchscreens hits them in the battery department: Most offer average endurance at best, though Intel's energy-efficient Haswell processors are helping with that problem. Again, strive to try before you buy. If you need buying recommendations, we've been particularly impressed by the Lenovo Yoga 11s (starting at $800) and the Dell XPS 12 (starting at $900). Lenovo also offers the sweet-looking 13.3-inch Yoga 2 Pro with a 3200-by-1800 display starting at $930, but it's yet to visit the PCWorld Labs. Then there's Microsoft's own 10.6-inch Surface Pro 2. This $900-plus chameleon dabbles in all categories. It's technically a tablet, but it runs a powerful, laptop-grade Core i5 "Haswell" processor capable of tackling tough tasks such as video editing, image creation, or keeping dozens of programs open simultaneously. With the docking station accessory coming in early 2014, the Surface Pro 2 could even double as a capable desktop PC. That said, Microsoft's x86-powered slate is pricey, and that's before you factor in the cost of a $120 (and up) keyboard accessory. It's also thick and short-lived for a tablet, though recent firmware updates have given it a battery boost. The Surface Pro 2's mix of pros and cons definitely drop it into niche territory, but business pros and graphics/video enthusiasts may just love the tablet's blend of power and portability. PCWorld's review of the Surface Pro 2 has all the juicy details. The original Surface Pro is still available as well, starting at $700. The forerunner brings many of the same benefits to the table, but its drawbacks--namely an atrocious battery life and only a single kickstand position--are more pronounced. You'll still need to buy a separate Touch Cover or Type Cover, and the first Surface Pro will also be compatible with the forthcoming docking station. If you're looking for a sedentary PC, you have only one simple follow-up question to consider: Do you want a traditional tower PC or an all-in-one? 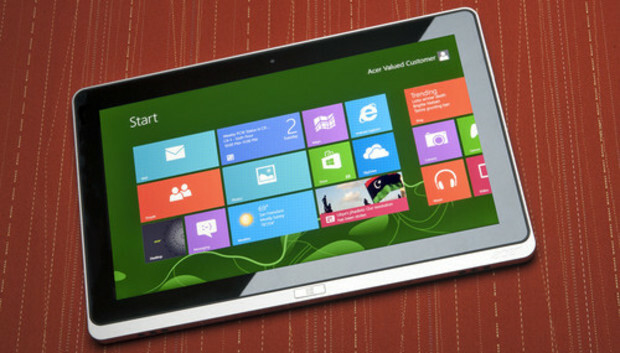 All-in-ones such as Lenovo's C540 Touch often (but not always) sport touchscreens that let you take full advantage of Windows 8's finger-friendly live tiles and modern apps. AIOs also integrate their hardware into their monitor, which means you won't have to find a place to store a big fat PC case--though desk space may still be an issue if you're looking into an incredibly nifty yet borderline ludicrous "tabletop tablet" all-in-one hybrid. AIOs have a few notable drawbacks, however. For one, they're pricier than tower PCs, though you should remember that all-in-ones include the cost of a monitor. The integrated nature of AIOs also brings some inherent limitations. Future upgrade options are slim to none in a tightly packed all-in-one, and AIOs tend to use mobile-grade components that are less powerful than their proper-desktop counterparts. Even still, most AIOs are more than capable of handling casual everyday workloads, such as surfing the Web, streaming videos, or playing music. Satisfactory 3D gaming is usually out of the question. No matter what kind of desktop you buy, we recommend targeting a minimum of 4GB of RAM and a minimum of 500GB of hard-drive space--unless you're buying a superspeedy SSD. As for the processor, target an Intel Core i3, i5, or i7 CPU, an AMD FX-series CPU, or an AMD A8- or A10-series accelerated processing unit (APU). Sure, Windows 8 can technically run on less, but attempting to make it do so will result in a subpar experience with all but the lightest of loads. If you're looking to crunch big numbers, edit videos, dive into intense 3D gaming, or engage in any similarly strenuous PC tasks, you'll want to invest in a system with a Core i5 or Core i7 processor. Boutique PC builder Puget Systems has an excellent overview of the differences between Core processor types. Meanwhile, PCWorld's desktop hub can fill you in on all the latest and greatest PC reviews, news items, and more. Knowing is more than half the battle when it comes to purchasing a device that costs several hundred bucks. Whew! Did I leave out something important in this flood of words? Share your buying tips in the comments area below, and again, don't forget to check out PCWorld's chart of the best Windows 8 devices available today.